The Korean company's plant «AYWIPARTS», producing a significant portion of the range of spare parts brand, expand its testing laboratory, which is engaged in random testing of parts from different parties. With the increase in production volumes and increased quality requirements by the European partners, it was decided to purchase the latest equipment for testing. 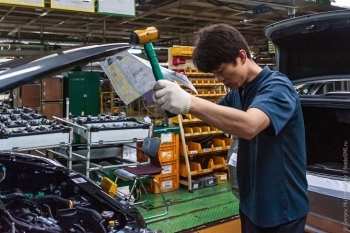 Experts who have already begun work in the laboratory have been trained in one of the largest centers for certification of automotive parts in Seoul. They will be engaged in the selection of the desired number of samples of each batch of test and on basic performance. The company «AYWIPARTS» took part in the largest exhibition of spare parts and service in Europe - Frankfurt «Automechanika». After opening a branch in Germany, it was a logical step to demonstrate the capabilities and familiarity with European partners. In recent years, many companies of the Old World are paying more attention to products from Asian manufacturers. In this regard, «AYWIPARTS» concluded a number of major contracts with companies from Poland, Germany and Hungary for the supply of spare parts for popular models. Guide «AYWIPARTS» confident that partners will receive positive feedback from its customers, and mutually beneficial cooperation will reach a new level. It was obtained ISO 9001quality certificate. The company «AYWIPARTS» received the certificate of the International Organization for Standardization (ISO) ISO 9001. This document confirms that the production and management system of international standards, is proof of the high and stable quality of products. It should be noted that the passage of the ISO to audit companies «AYWIPARTS» was not required to carry out large-scale modernization. Compliance with all standards have been incorporated initially and annually acknowledges receipt of similar national certificate in Korea. ISO 9001 certification will further work actively with the European partners, who traditionally pay more attention to the level and status of the manufacturer's spare parts.